Here are 10 of the most iconic horror film weapons. You may have used a few of them for your own hunting and sport shooting adventures. 10. From Dusk Till dawn - Winchester Model 1912 "Crucifix Shotgun"
If you know horror films, you probably know that the good guys at some point are going to have to battle it out with the bad. In the film From Dusk Till Dawn, the heroes are trapped in a room where they each handcraft their weapon of choice to take on a legion of demons. Making an unlikely yet useful hybrid, the Ex-Preacher combines a Winchester Model 1912, with a riot handle and baseball bat to dispel evil. We've all been stuck on the side of the road at some point. The horror film Wolf Creek tapped into our fears of being broken down in the middle of nowhere. Now add the long-range accuracy of a Tikka M595, a man who enjoys hunting humans, and you've finally got a reason to take care of that check engine light. Winchester "Yellow Boy" rifle Winchester, also the name of the bar where our heroes take refuge in the film, named this 1866 rifle "Yellow Boy" after its brass covered receiver. Shaun uses this Winchester to keep the zombies at bay while he and his company flee the bar to safety. The Yellow Boy made Winchester synonymous with the "Wild West" and dominated the frontier in the late 1800's. When you're taking on an alien armed with countless traps and weapons, a mini gun doesn't seem too out of place. Dubbed "Ol' Painless," the M134 is a handheld minigun that can shoot 1,250 rounds per second. Ever seen a minigun take down a jungle? Jesse Ventura and the M134 minigun will provide your education below. You've surely used a machete at some point to cut through brush and thick cover. Friday the 13th's villain Jason carted around one and used it to dispose of Camp Crystal Lake counselors who don't heed his warning. Single-handed machetes are typically 26 inches tops; Jason's topped 30 inches. In the films, he wields his oversized machete like a toy bat. Jason's machete currently has the highest body count in slasher film history. The M41A pulse rifle that was created for the movie Aliens and its sequels is a combination of three weapons: An M1 Thompson, an SPAS-12 shotgun, and a Remington 870 grenade launcher. You may be wondering why this weapon is on this list. It was a prop weapon until one company made a functioning model. Game over man. Trapped in the Arctic fighting a shape-shifting alien, R.J. MacReady evens the odds with an M2A1-7 flamethrower. Used primarily in Vietnam, this edition of the M2 flame-throwing unit has an effective range of nearly 66 feet. During filming, the actors used real military-grade, liquid-fueled flamethrowers. That's pretty rare in the movie world, but I'm sure it was a bunch of fun for the actors. 2. 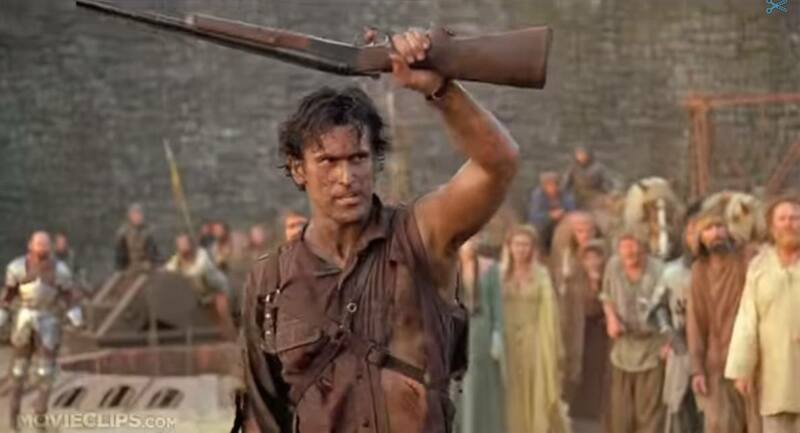 Army of Darkness - Stoeger Coach Gun, the "Boomstick"
In this sequel to Evil Dead II, Ash's "Boomstick" is one of his most memorable defenses against the Deadites. In the movie, the Stoeger Coach Gun is misidentified as a Remington double barrel and it fires more than the typical two-shell allotment. But as long as it saved the world from the apocalypse, who's counting, right? Chief Brody uses the M1 Garand to end the terror of this monster Great White in the film Jaws. The M1 Garand got it's stripes as the U.S. military's primary rifle from WWII until the beginning of Vietnam. The M1 Garand took down the Axis powers so no question it could take out a charging Great White shark. Spare scuba tank required.